This week we’re continuing on the breakfast theme, and the banana theme! I’m not a huge cereal person. I was never really in to all the different fancy cereals Nestlé used to come out with every week, rather unlike my brother who tried them ALL. I was always the victim of cereal box toy bullying instead. Which was fine, I mean I turned out fine. Completely fine. *stares blankly to the side* On a side note, has anyone noticed how they’ve actually stopped putting gifts in cereal boxes?! Like, you have to buy like a dozen boxes to get codes and put them in online and request your free toy?! Who has time for that?? Or am I too old and have they never put them in the little plastic wrappers in adult cereal… I don’t know. Back to the granola. 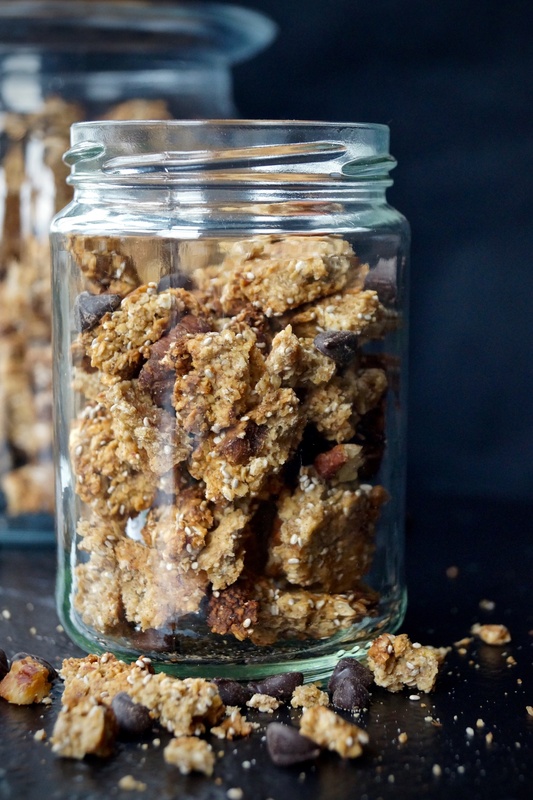 Shop bought granola is laced with unnecessary sugar, preservatives and other nasty things. Like most things, to ensure you know exactly what you’re eating, you have to make it yourself! Luckily, it could not be any easier. 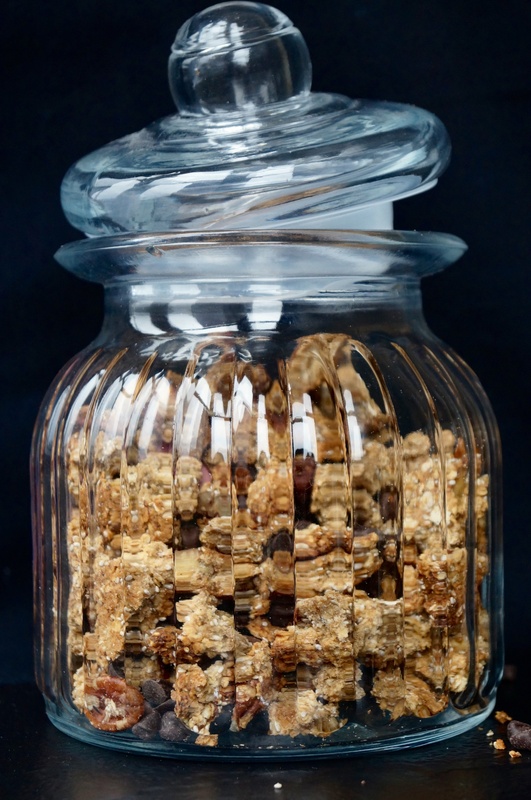 This granola is mildly sweetened with banana and maple syrup, though the banana is so subtle you would never even know it was in there. Another binding agent and natural sweetener is apple sauce. This stuff is huge in the States, they routinely use it for baking as substitutes for sweeteners and binders. Here, it’s quite difficult to get pure unprocessed apple sauce without all the additives and sugar. Until I had a brainwave and patrolled the baby food section of the supermarket. Low and behold, in tiny little jars, unsweetened pure 100% pureed apples. Et voilà – applesauce. I also added chia seeds to my granola to up the nutritional value and give it a fibre and protein boost. If you can’t get hold of chia seeds then feel free to omit or add any other seeds you like. Sunflower seeds would be nice! 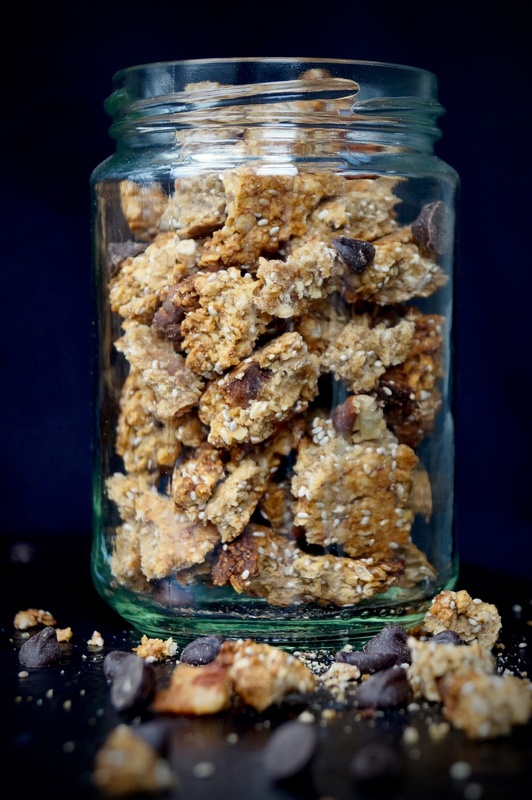 The ingredients, apart from the oats are widely interchangeable and that’s perfect because I don’t know about you but I can’t eat the same breakfast every day for more than about a week! 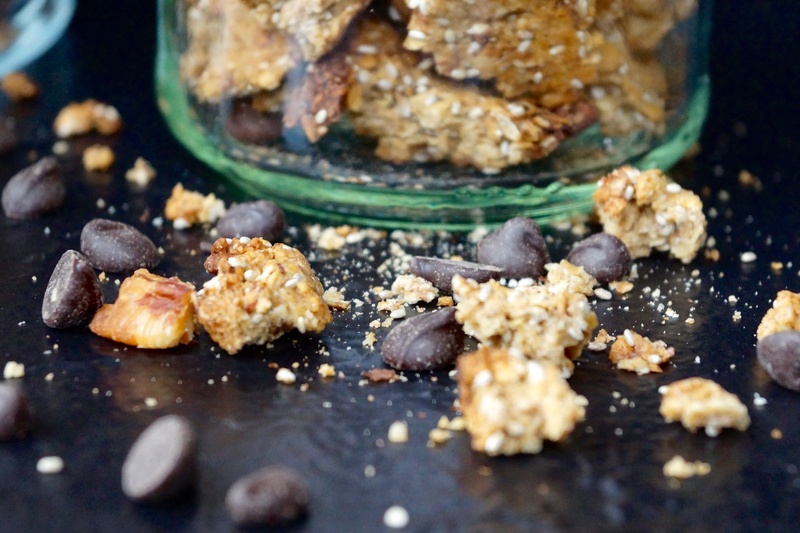 The dark chocolate chips add a nice dimension of flavour to the otherwise refined sugar free granola. 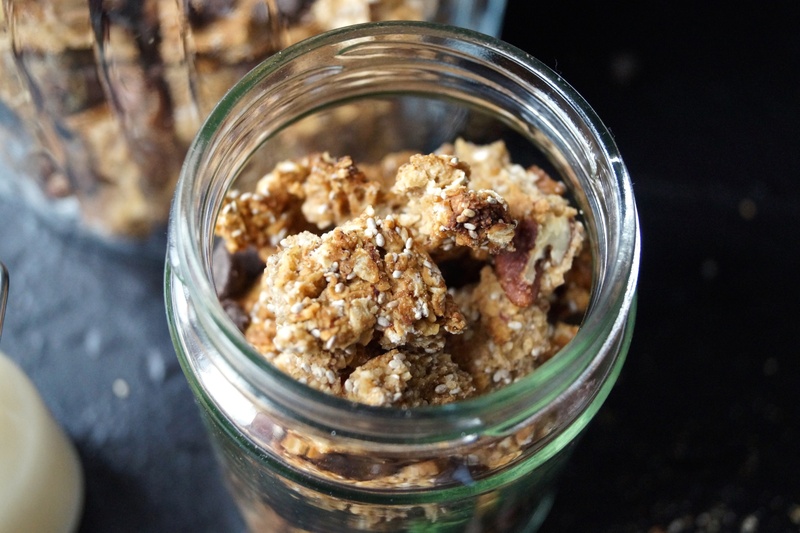 I like my granola to have huge clusters of crunch so I made it extra chunky and broke it into large pieces rather than small. 1) Preheat the oven to 160FAN and line a baking tray with parchment paper. 2) In a large bowl, mix together the oats, chia seeds, salt, cinnamon together. Break the nuts into slightly smaller pieces and add those in too. 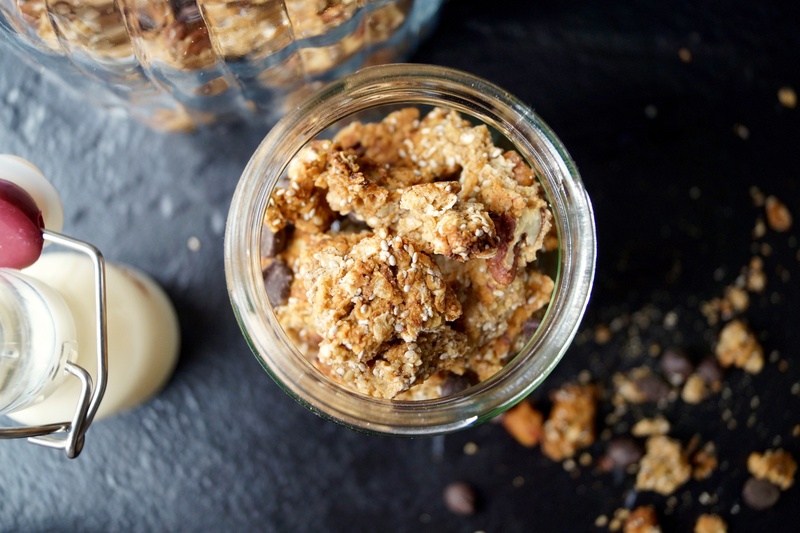 6) Spread the granola on to the baking tray and bake for 35-40 mins or until golden brown. Move the tray around in the oven if necessary to ensure even colouring. 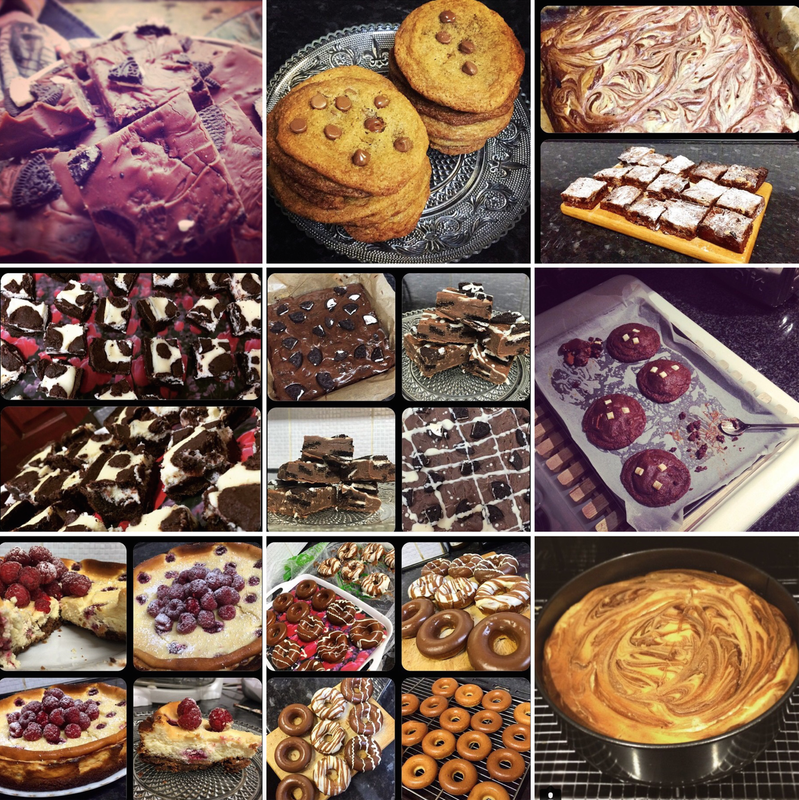 Also this week, I’d like to shout out all the #BakedByH bakers on Instagram! I love it when I see you guys post pictures of stuff you’ve made from my blog. It really does make all the effort worth it when I see other people gain from what I publish. You’ve all done a great job and I can’t wait to see more of your BBH creations!